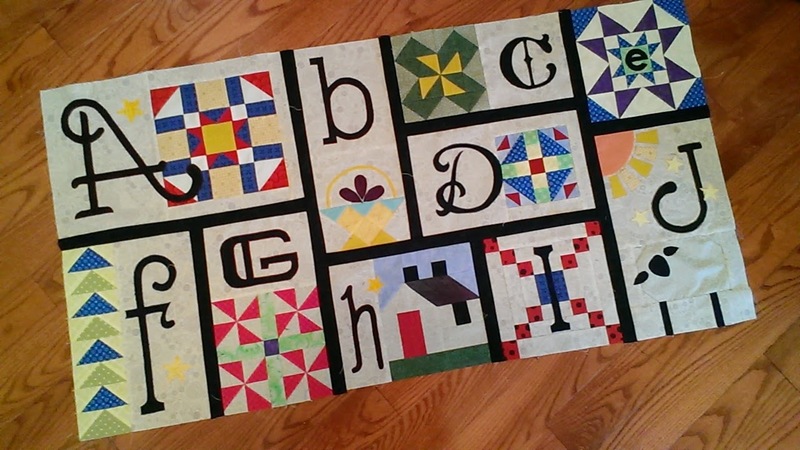 Actually as you probably know, this little quilt has ten flags. See, I'm going to visit my sister on Friday. 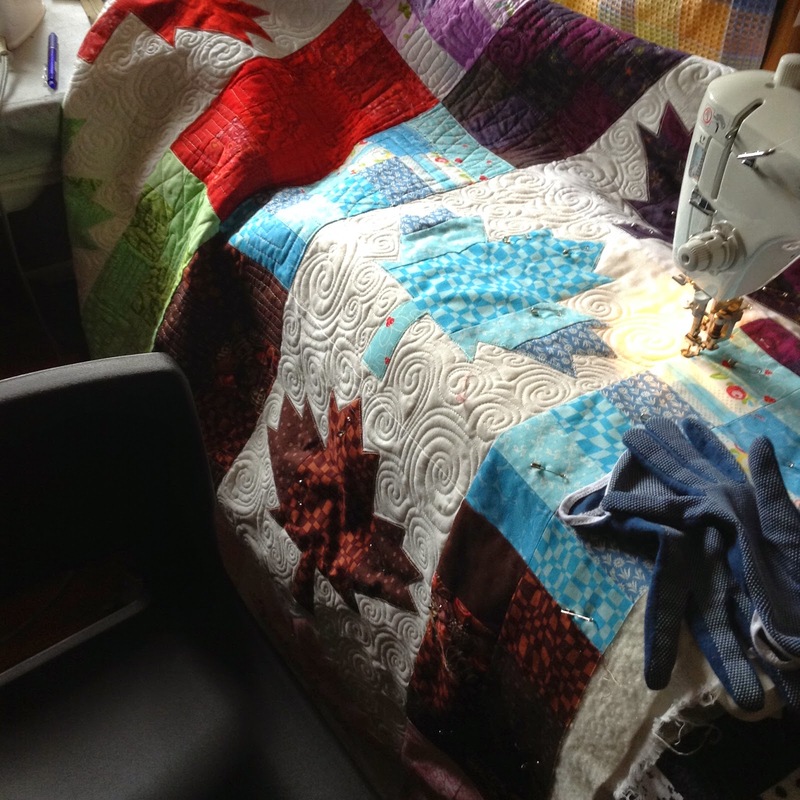 For the past few days, I've been focusing on getting this Canada Day quilt done for her. It's going to be for her new Boler trailer. It's like a cute vintage cottage on wheels. I know they'll probably be taking it camping the long weekend in May. And I want her to have this quilt for when she goes on her first trip. Right now, I can say the quilt is over 50% machine quilted. If I stick to my guns and spend an hour today to quilt the maple leaves, and another hour tomorrow quilting the outside borders, the last hour binding will go like a breeze. Do you know what bugs me? Binding inside corners. Yes, in my old age, many things bug me. Today I finished a table topper that I started last summer. Actually I made two of these, and finished one quite quickly to give to my sister. The other sat half made until this week. Back to what bugs me... I can say that I have mastered machine binding 90 degree corners. There were 8 of them on this little project. But, I've yet to find a good way to machine bind inside corners. Today, to bind this project, I used the "clip into the corner and sew on the binding in a straight line" technique. I followed that by trimming a little of the inside corner away after stitching on the first side of the binding. This left me with a less stuffed corner and the binding wrinkles folds in nicely... sorta.. But there has to be a better way. I'd love to know your technique if you have one to share. What a nice day. Everyone in our neighbourhood is having big Easter dinners. There are cars everywhere in our little court. Our family is no different. Aurora got here a little earlier than the others. 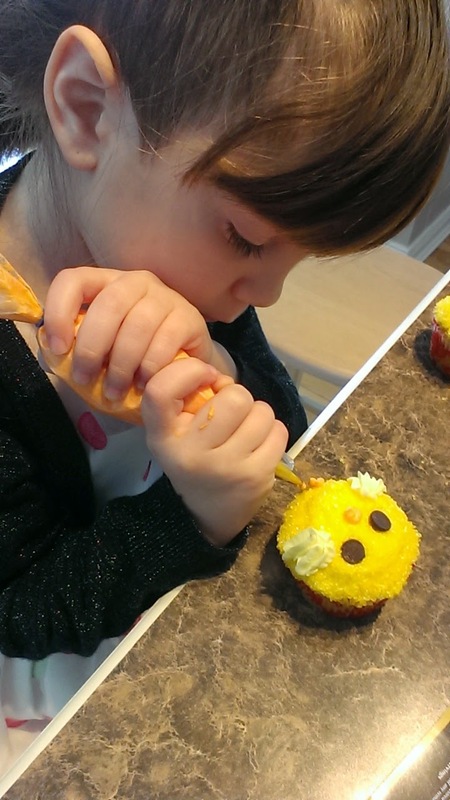 It's a good thing because I needed her help to turn these cupcakes into little Easter chicks. I had all the ingredients already. I even made a sample chick so she could have one to look at while she was working. 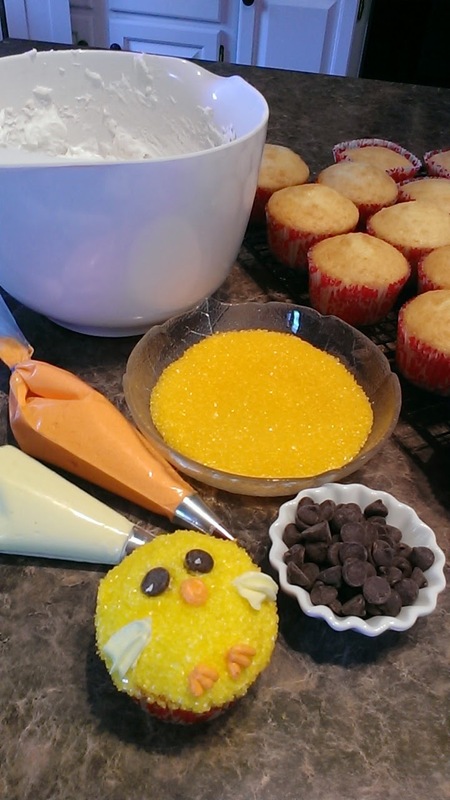 We had white icing, yellow big sugar, chocolate chips, orange icing, and light yellow icing, and of course cooked cupcakes. She dipped the iced cupcakes into the big yellow sugar. Then added chocolate chips for the eyes, added the little wings, and finally added the beek and little chicken feet. She did a great job and all the kids told her what a nice job she did making the chicks. And I know they had to be delicious because all two dozen cupcakes are GONE!! I took a little time today to cut the strips to sash up the top of the third of the quilt. Ten out of the 26 letters are now done. I'll put this away until the middle third is completed. There is only 7 letters in the middle section and the instructions for those will be issued over the next two months. I'm so glad I've kept up so far. See I fear that the start and stopping of this project might not get started again. Anyway the more I do, the more I look forward to the beginning of each month when the new blocks are released on "The Quilt Show". Is anyone else out there doing this BOM? Don't Mess With My Hair!! My daughter is a hair salon owner in Saint John. Every year she goes to a conference in Halifax to learn about new things. This time, she came back all full of energy with a new tip for keeping your hair do. It's sleeping on a satin pillow. Ha, I thought to myself. My mother used to do that many many years ago. In fact I could write many blogs about hair things my mother did. In the 60's, she had many wigs. Then after the wig thing passed, she wore a pink foam wrap around her head at night... all to protect her weekly hairdo. And I remember she had satiny pillow cases. She swore by them. Well, back to the pillowcase. 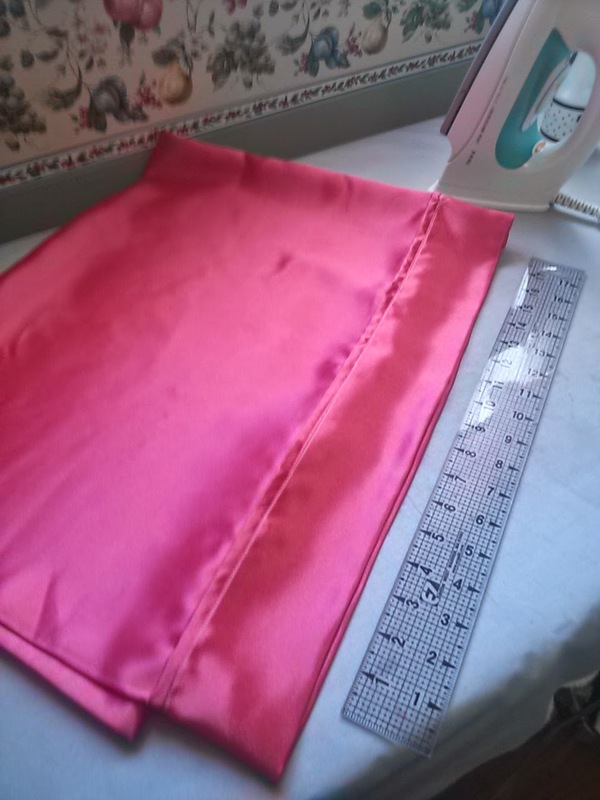 Today I made a prototype satin pillowcase for my daughter. I think she is going to try to make some to have available for her customers to purchase. See, this hair guru in Halifax said when you sleep on pillow in a cotton pillow case, the cotton grabs the ends of the hair and moves them out of place. You know.... Bedhead!! This is a simple pillowcase and the starting dimensions of the piece of fabric that I used was 44" x 36". I folded in half with wrong sides together and stitched one short end and one long end. Then trimmed the seam and turned the other way out and enclosed the seam with another seam. (French Seam). With a 3" cuff, folded under twice, stitched 5/8" along the edge to make a flange. This yields a finished pillow case of about 21" x 30". It will have no raw edges exposed and will fit a standard pillow. Me....As most of you know, my hair is so short, that I don't worry about preserving my DO. St. Anthony's Quilters had started to fizzle out. 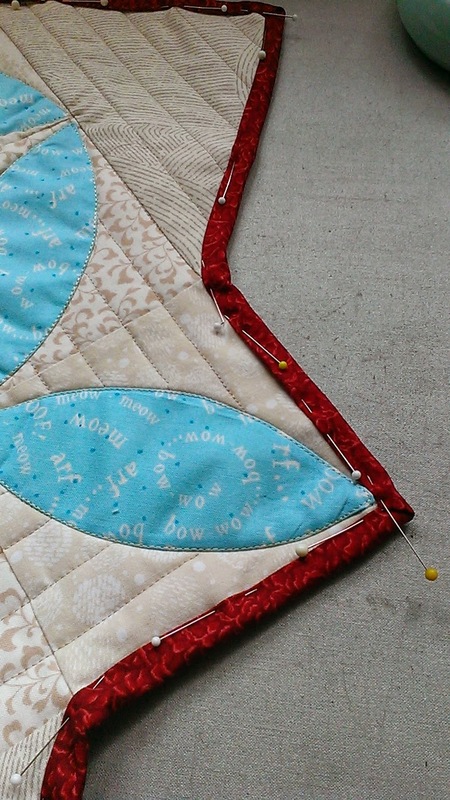 After a few years, there were only three quilters left. And one of them was me. When I went away this past winter, I left a small quilt top with them to quilt over the winter, and I thought, that's it, they probably won't continue after it's done. 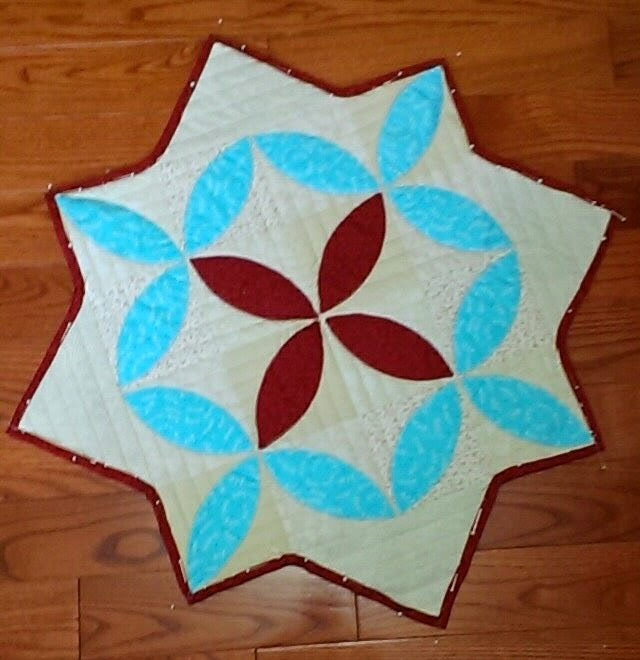 But over the winter, it seems that new energy has been found and they emailed me to say that now they have 8 quilters and want to put another quilt on the frame. It made me so happy. I told them I'd have a top ready after Easter for them, and to save the date to put it on the frame. Well, that's where UFO's come in really handy. 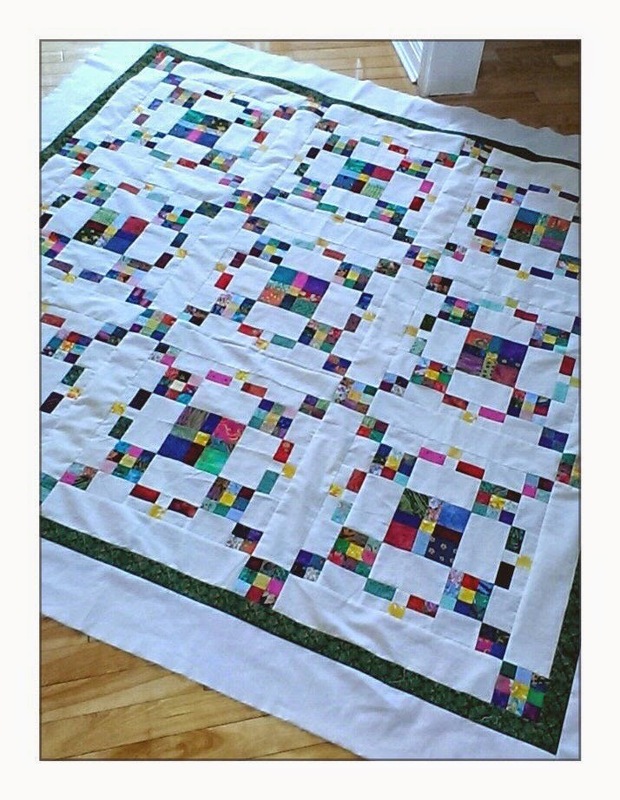 I had the nine big blocks done on this Burgoyne Surrounded quilt and the sashing was cut out. All tucked away. It didn't take much effort to sash the nine blocks, assemble and put two simple borders. It's now a great 70" x 70" quilt for these quilters to work on over the next few months. Squint your eyes to see the great effect. Next Tuesday, this quilt will go on the frame, and I can't wait until Wednesday to see who these 8 gals are. UFO's. They are a good thing. April BOM - A-Z Ewe and Me. I feel like I'm getting my mojo back as far as sewing goes. With having little Aurora around on the weekend, and going to a guild meeting today, I'm feeling really inspired.. 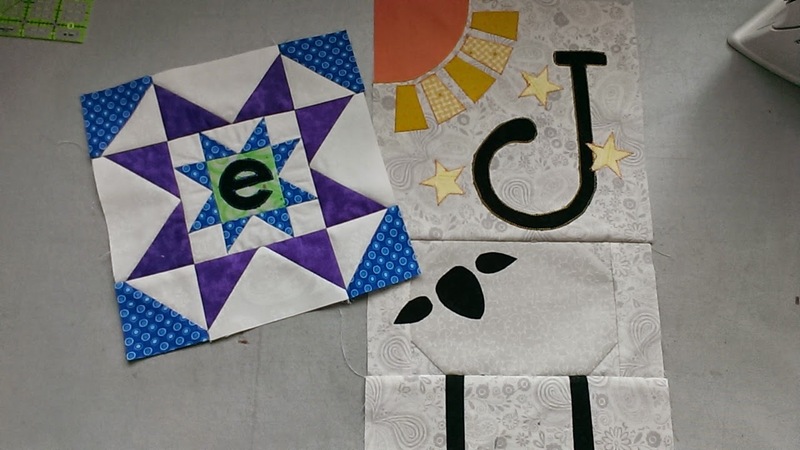 I have the April Blocks done from the BOM project on the Quilt Show. My Ewe is blends in with the to background too much, so I may outline in black blanket stitch to highlight it. Now I have all the blocks complete for the top third of the quilt. I'll be sashing and putting these together soon. oh shoot, I just realized I should have sewn the ewe to the bottom of the E. hmmm.. I'd better check the pattern. Looks like a a little unpicking might be in order. Edit: I checked. It's right. Whew..
Aurora was here all weekend for a long overdue visit. We hadn't spent time with her all winter and we had plans for a great weekend. We went to her cousins volleyball game, watched movies and did some crafts. One of the movies she watched was "Frozen". I guess she has watched it at home many many times. After watching it yesterday afternoon, she said, "Let's go make a cape." I thought she said a cake. I said, ok, let's go. She promptly corrected me when I went in to the kitchen and said, "what kind of cake should we make?" "Nooooo" she said, " A Cape!" 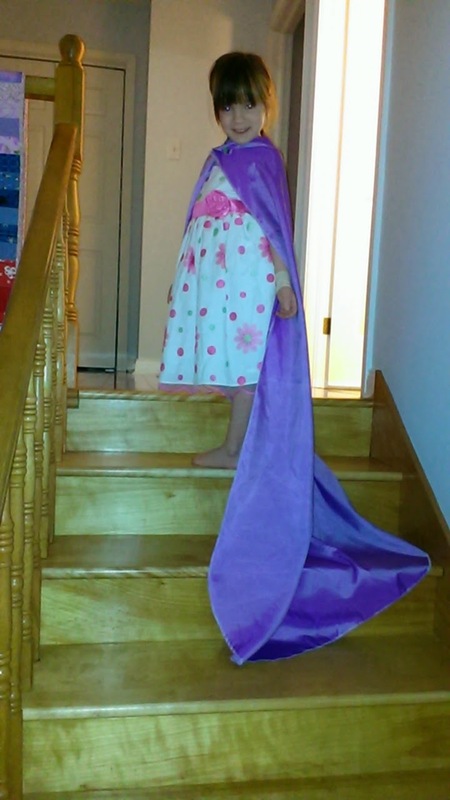 Anyway, indeed, she wanted a cape, just like Elsa's, in the movie. It was to be a long, really long cape. So long, that it cascaded down the staircase. It needed to be purple and it had to fasten around the neckline with a beautiful Jewel. How do you think we did? Aurora was thrilled, and while sitting with me on the couch later, with her cape on, she showed me her cupped hands. She said quietly "I can feel the power coming into my hands." I'm not sure what that means but it was so cute. I guess I need to watch the movie to find out what it's all about. Well, we've been home for a couple of days. Its taken a few days to get back into a routine. Mondays help... It's a great day to head into the sewing room. It's raining out. And I always look at a rainy day as a great sewing day. And the bonus is that I know it will take down some of the snow that was here to greet us when we got home. 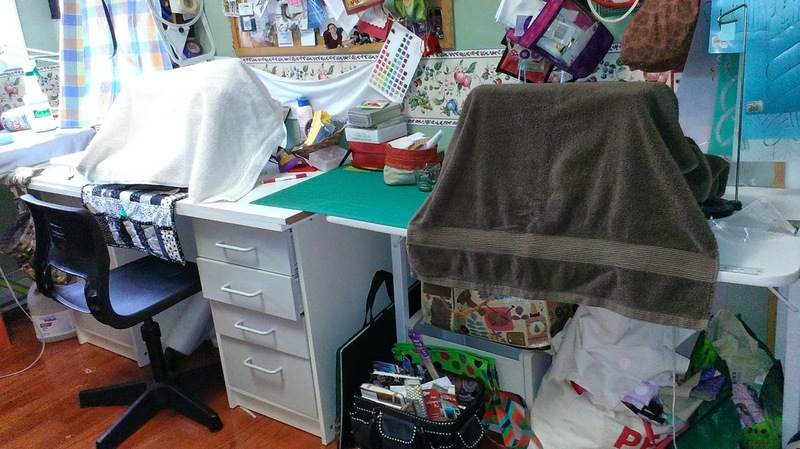 While I was away, I covered my sewing machines with heavy towels since I don't have sewing machine covers. After removing the towels, I plugged in the machines, and now everything is ready for me to sew!!! 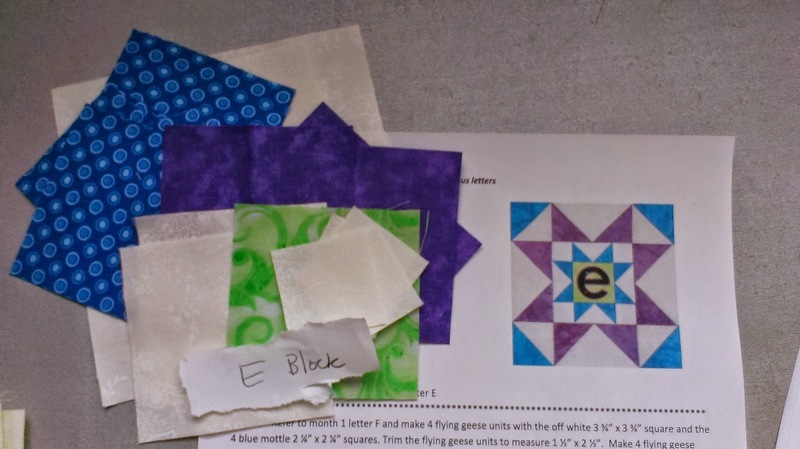 The E block fabrics. My darker blue is actually quite purple. 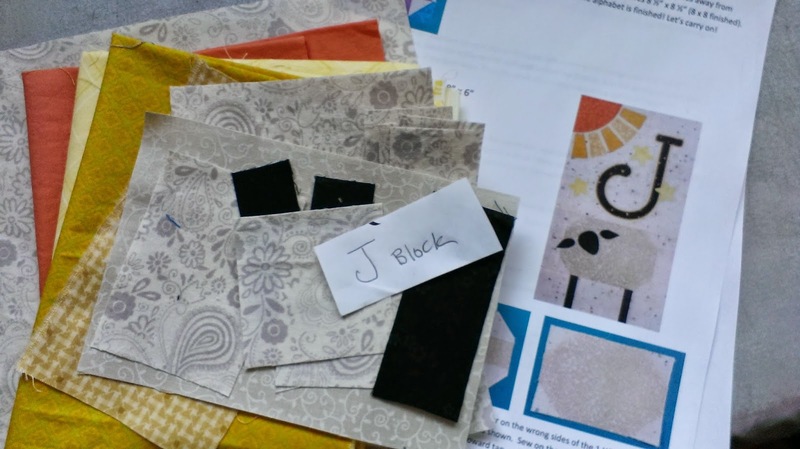 The J block fabrics. Ahh, do you see the Ewe!! So cute! I may sew later today or... I may not... but it sure feels good to be back.